The bulldog! Ok, and the donuts.. and the dress.. and the burgundy wine Ranunculus! 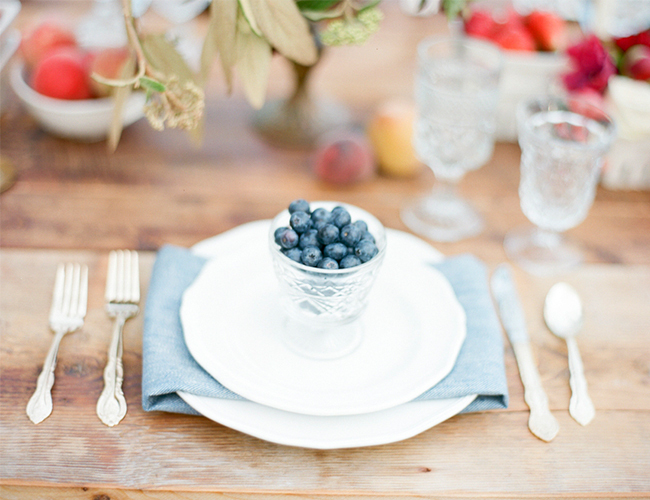 This Summer wedding shoot was inspired by those yummy summer berries that decorate the table and add so much color! 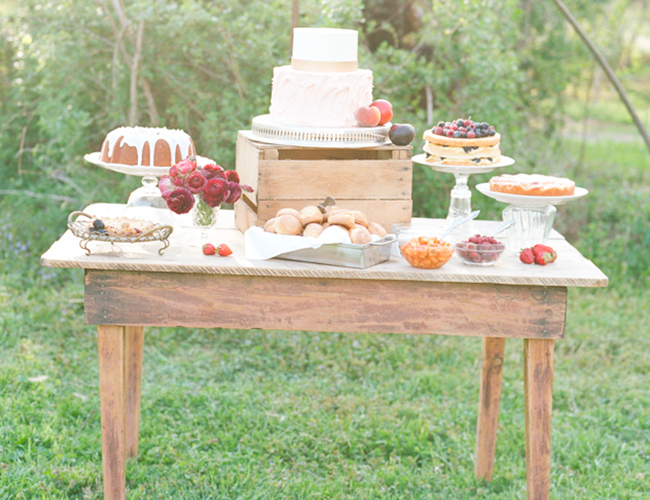 Fruit and wildflowers galore, who wouldn’t want to sit down at that table on a summer’s eve and watch the little ring bearer dive in to the blackberry pie! Save some for us! Those treats look almost too yummy to eat (almost ;))! I mean, we’re melting at that Devils Food cake with white chocolate cream and chocolate ganache! 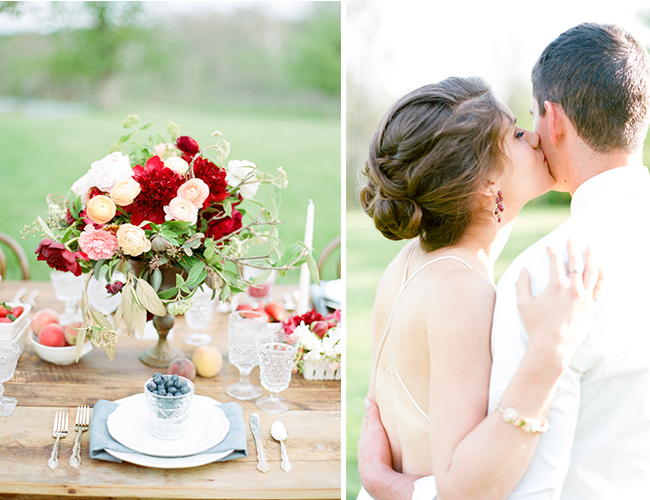 I’m a sucker for farms in the summertime, and I really wanted to create a comfortable, sophisticated setting for a farm wedding that incorporated the sweetest part of summer: fruit! I love the way the dramatic colors of the blackberries play off of the brightness of the strawberries and the softness of the peaches. 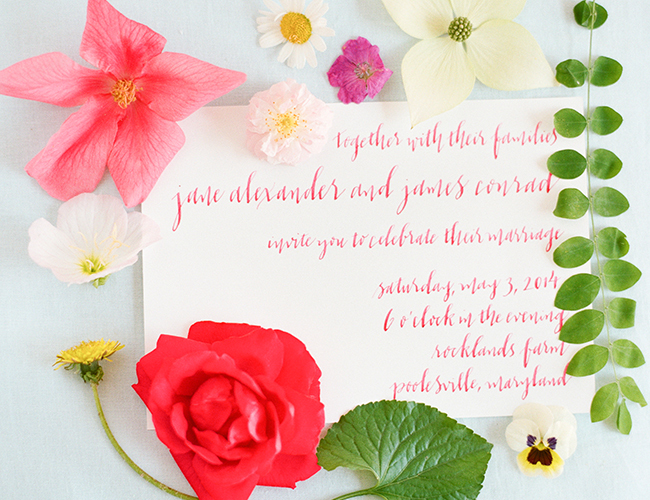 The depth of colors is so beautiful and the range of what you can do with summer fruit as inspiration…just look at all of the incredible pastries from BIJOUX Fine Cakes and the stunning floral arrangements from Sidra Forman! I love the feeling of down-home comfort and fun this shoot brings. 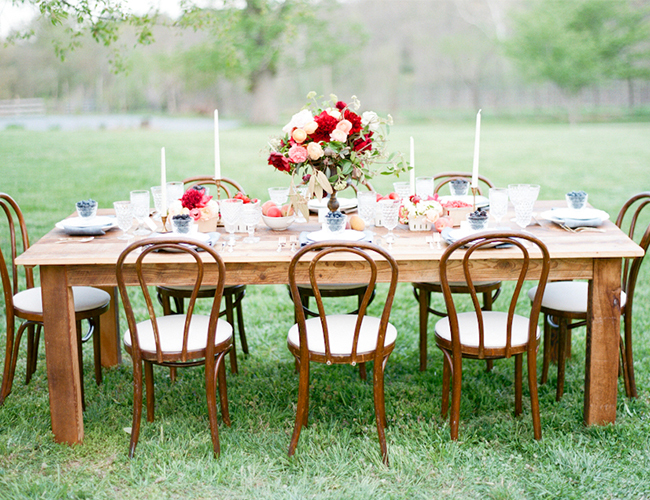 Everything from the historic farmhouse at Rocklands Farm to the cutest toddler and bulldog to the gorgeous furniture from Something Vintage creates the perfect setting for a relaxed and refined family farm wedding. We had this idea of juxtaposing the dark blues in the blackberries and blueberries with some delicate peaches. We thought this would create a fun and delicious color palette. 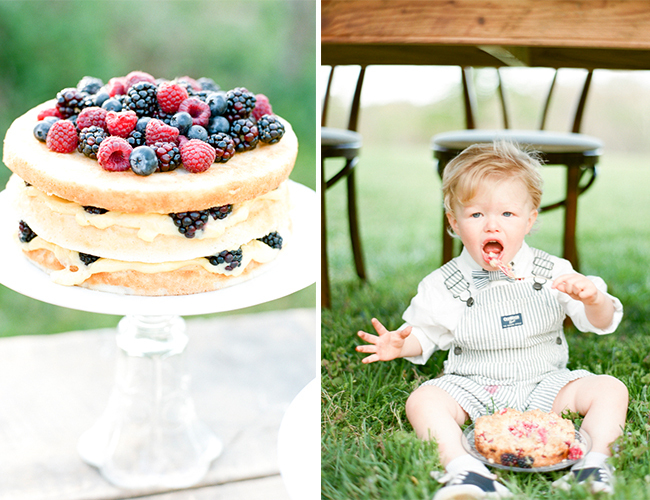 I had the vision of the little ring bearer eating blackberry pie underneath the tablescape fairly early on in the planning. 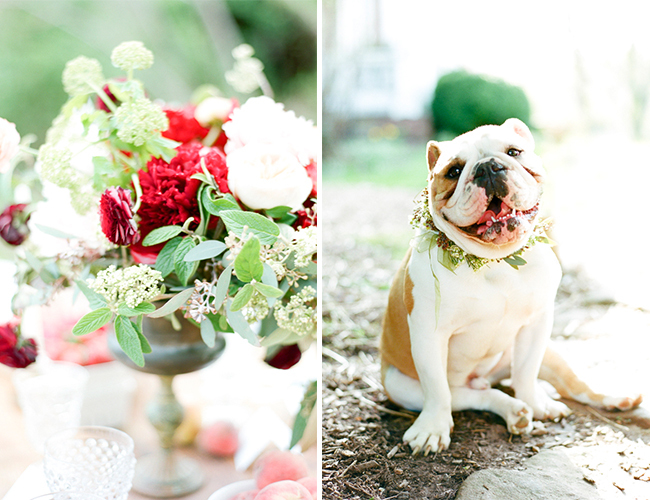 I’ve been wanting a bulldog for so long, and thought that incorporating one into this shoot would add a playful touch. Brutus was such a doll and stole the show! Hair & Make-up: Alison Harper & Co.
Ah gorgeous!! Love the flowers and how the berries make it feel so fresh! So true! Thanks for reading Kylie! 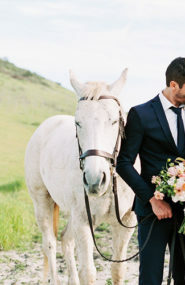 This wedding shoot is darling! Really inspired! Inspired by your concept, light colors, weather selection. Thanks for sharing such a great inspiration! I just love everything about this shoot. 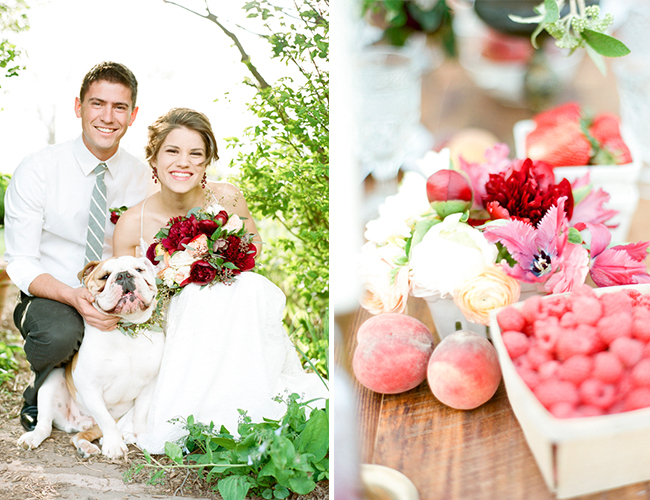 The colors, the berries, the flowers, the bulldog…so good! Just love these photos! What a fantastic job! What amazing Photographs and creative theme. Great job to all the creatives! Thanks Martha! They are definitely a talented team! 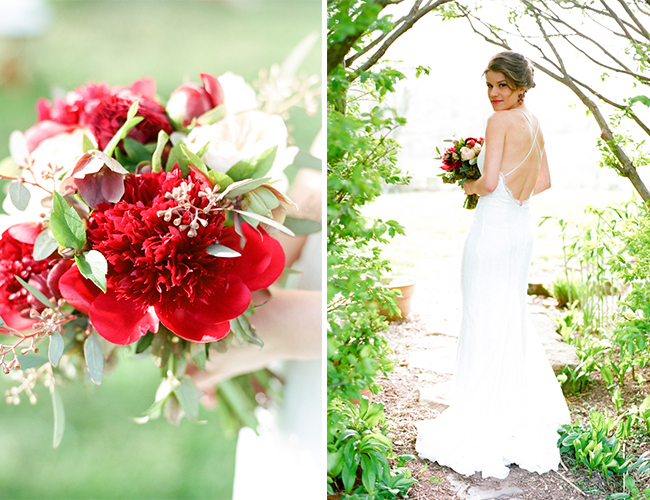 Thank you for sharing this styled shoot! We loved helping the bride with her hair and makeup, who knew my sweet pup Brutus would be so popular! Sorry ladies, he’s my wrinkly snuggle bug! 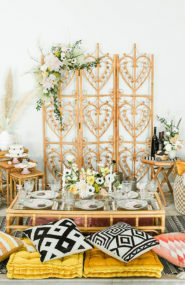 Do you know the style of the chairs in the above photo? Id LOVE to hunt for them online! 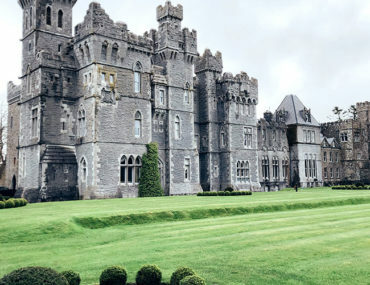 I love this wedding!! 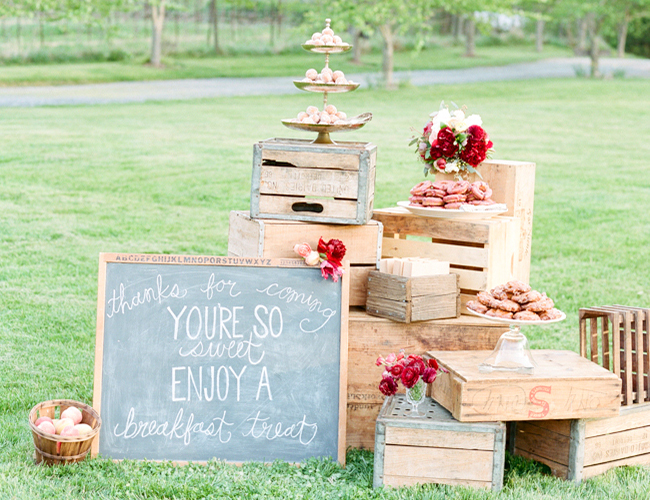 That dessert table looks way too yummy and that boy is TOO CUTE! 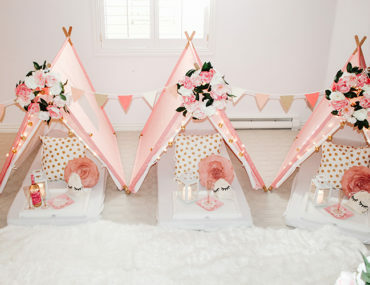 Do you happen to know the name of the style of chairs pictured above? I’d love to hunt for them online! They are bentwood chairs. Happy hunting! 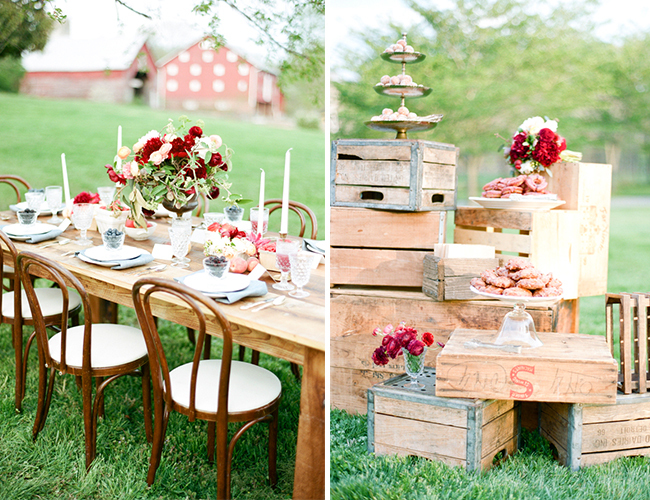 The summer wedding’s colors are really beautiful and amazing!I fell in love with the colorful inspiration. Thanks Catherine, so did we! What a cute and colorful shoot! Brutus is such a good model too.